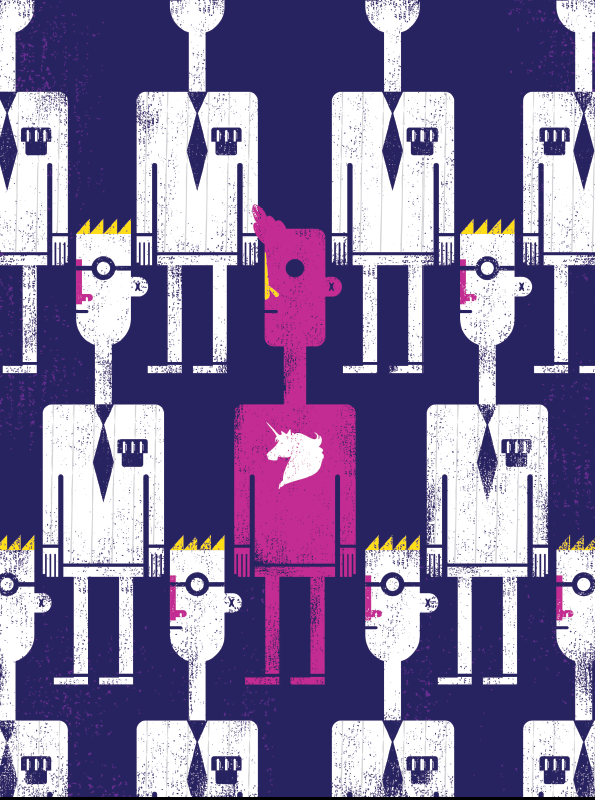 STUART CAMERON REMEMBERS the first time Unicorns in Tech set up a booth at a major tech/IT conference. “People would stop and see ‘Unicorns’ and think, ‘Oh that looks like fun,’ and then see the subtitle, ‘LGBTQ in Tech,’ and run away! Or ask us why we were there. It was really terrible to see this reaction.” And that was only a few years ago, in very queer Berlin. As a Canadian who has lived in Berlin on and off for years, and who finds the city almost too informal and relaxed, to the point of difference-denying, I found this shocking. My first impulse was to be very Canadian about the story and become righteously indignant. And then Cameron started laughing. Sitting in his sunny Berlin apartment/office/hub with his two 20-something co-workers, the anecdote seems ridiculous to him, a story from a previous generation. Cameron, along with Jasmin Meiling and Marty Gormley, are the producers of Berlin’s massive Sticks & Stones, an annual LGBTQ-centric tech/IT Karrieremesse (a perfectly German word for this hybrid conference, career fair and party) that opens its sixth edition in June. 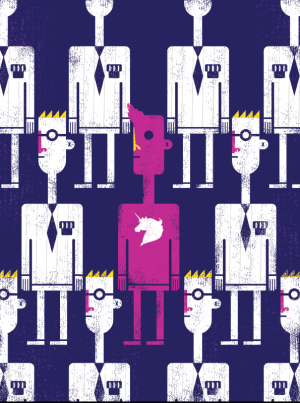 From the funds that S&S brings in, the group puts together Unicorns in Tech events. Unicorns in Tech has a simple goal: to create events and meeting spaces in Berlin (and eventually elsewhere) where queers and their allies who are working in tech/IT can network and share information in safety. Why is the tech world so backward? Why does an industry based on knowledge sharing still need conferences and advocacy groups to teach them the basic values of diversity? Forget altruism, doesn’t everybody know now that being inclusive is profitable? Lukas Blakk, a Canadian tech expert who lives and works in San Francisco, and an old pal, recently spoke at a Unicorns in Tech gathering sponsored by SoundCloud. Blakk’s topic was a program Blakk created, in co-operation with a former employer, to build funded, safe spaces for marginalized people to learn how to code and thus gain entry to work in the tech field. The program was a stunning success, and several of the participants are now working in tech. Blakk’s talk at Unicorns in Tech was well received, but Blakk is keenly aware of the pitfalls when social justice meets corporate profits. SoundCloud, the sponsor of the talk, is, after all, a third-party partner with Twitter and iTunes and is valued at between $1-2 billion (depending on which cranky music business executive you ask). “Events that are purely social and don’t try to leverage the good fortune of being in a very competitive (read: well-paying) industry serve no tangible purpose for the marginalized community members who don’t have access,” Blakk emails me after the talk. The core question of safety and, more importantly, of creating queer-inclusive spaces to thrive, remains mostly unanswered—even in Canada. In 2013, for instance, the Information Technology Association of Canada released a damning report on the representation of women in communications technology companies. The percentage of female-identified people on the boards of Canada’s largest tech companies was a mere 16.5 per cent. While there are no parallel statistics for LGBT representation, one imagines it is not much better. Queers-in-tech social groups come and go but appear, (unlike, say, HackerNest, a wildly successful, now international tech social gathering and information sharing group started in Toronto) to receive no corporate sponsorships. That’s not to knock HackerNest. Its open forum style and mission to spread prosperity via technology-sharing attracts a very diverse group of enthusiasts, even if LGBTQ participation is not specifically noted in the group’s PR. Berlin, with its low property costs and vibrant culture, is also quickly becoming a new tech wonderland. SoundCloud is based in Berlin, as is EyeEm, Wunderlist, and DeliveryHero, among others. It is also a start-up city for European tech entrepreneurs. And Berlin hosts the annual CEO-packed Tech Open Air festival. Subsequently, Berliners cannot stop talking, in increasingly panicked tones, about the rapid gentrification of their city. In the neighbourhood I live in, on the streets Isherwood once walked, cafes, bars, bookstores, and clubs are being replaced by kindergartens, modular furniture outlets, and“yummy mummy” clothing stores.